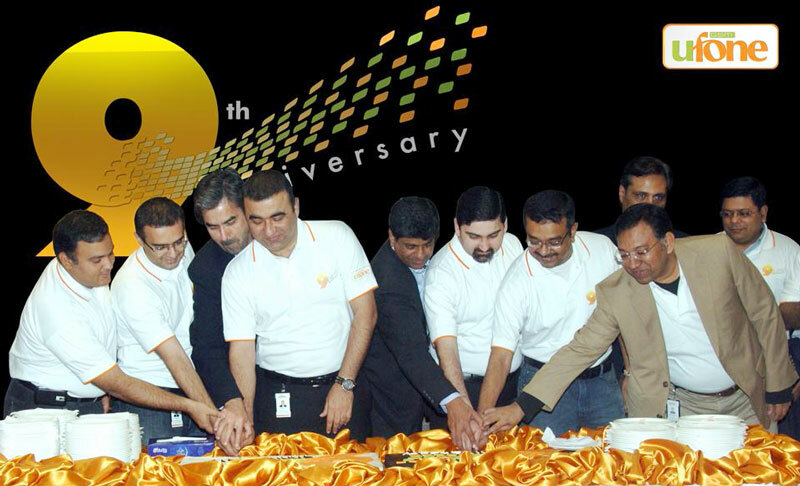 Ufone celebrated its 9th anniversary here on Friday at an impressive cake cutting ceremony. Mr. Abdul Aziz President & CEO Ufone, during the address to the Ufone team members said, “It is a common belief that it is difficult to smile in these trying circumstances, but we at Ufone, have plenty of reasons to smile and believe that all of Pakistan can find reasons to smile”. He declared that the next year’s theme for Ufone will be “Spreading smiles”. “On the auspicious occasion of the 9th anniversary, we look back at all our achievements with a smile and feel content that it has contributed substantially to the development of the telecom sector. Only in the last year we have made the largest contribution (42%) in the revenue growth of the telecom industry & have produced excellent results by clocking 2.5 times growth versus industry average”, he added. Mr. Aziz said that Ufone believed in spreading smiles through everything we do. Our advertisements, economical packages & quality of network & customer services have always brought smiles on faces of our valued customers and we promise to take that forward. He said “This day brings us hope & it gives us the opportunity to reflect & explore avenues to do even better, because it’s the constant search for reaching new heights which makes Ufone successful”. Till its 10th anniversary, Ufone will be dropped to 5th position, even then they’ll smile and claim that they’re number 1. Current management will sink this boat happily. Looser Tum Hi To Ho! If we look at the 9 years journey of Ufone it is pretty much clear that nothing can shake it for the next 900 years. No match to u fone for its wonderful packages and services over the last 09 years. If it keep on growing with the same pace then it may be the next Market leader. Statement of Mr. Abdul Aziz is so ridiculous. more than 70% customers are not satisfied with ufone. you are all jaleous from Ufone exept ALI SHAH. and jaleousy is bad…….. I am using Ufone from last eight years and I think Ufone providing good packages and VAS. Ufone, simply the Best network and service provider in Pakistan. salam, i m also user of ufone.. ufone is great.. i love ufone..this is our pakistani company, my all family is user of ufone… (kuch kutty UFONE pe bonk rahe han, kutto ufone kabi b 5th number pe nahi ae ga, yeh 1st number pe jae ga…I LOVE UFONE. UFONE tum he to ho…. Baki sab Bakwas….. jazz bakwas, telenor Bakwas…………i love i like ufone.